If you have explored this site, you will have noticed the term ‘Android’ being used in association with the interactive flat screen. The chances are you are familiar with the term and you probably know what it is if you own a tablet or smartphone. If you don’t know what it is, here is a quick exposition. Android is an operating system (OS) used by the vast majority of tablets and smartphones in the world today. However, its use is not restricted to these devices. These days, Android is found in HDTVs, laptops, games consoles, digital cameras and, of course, interactive touch screens. The best feature of Android is its easy to use interface which allows manipulation of objects on the screen. Swiping, tapping and pinching are all enabled. As the interactive flat screen is like a giant tablet, it is no surprise to find there is Android technology in it. Another feature of Android is syncing, which allows you to keep all your information including websites, calendar entries, email and apps up to date. One very handy feature is that it backs up your contacts for you. Every time you save a number to your address book it is synced to your Google account so that, if you lose your phone, all your numbers will be saved and ready for when you get a new Android phone. Android is an open source software which has been owned by Google since 2005. Based on the Linux OS, it was developed by the ‘Open Handset Alliance’, which is a consortium of mobile phone and telecommunications companies, after it was acquired by Google. As an open source software, developers are allowed to create applications based on Android easily. One of the consequences of this is that mobile phones have become increasingly customizable. Android is the most used OS for smartphones and tablets today. It is about to become an all-encompassing framework for not only smartphones but any system that requires a simple, elegant and easy to use interface, such as HDTVs, automotive infotainment systems and interactive touch screens. Because of its flexibility and adaptability manufacturers can easily modify Android for their devices in order to differentiate them from their competitors’ devices. The Android platform can be customized, adjusted and distributed freely. You can also download hundreds of thousands of games and apps from Google Play using Android which makes Android the ideal OS for interactive touch screens. 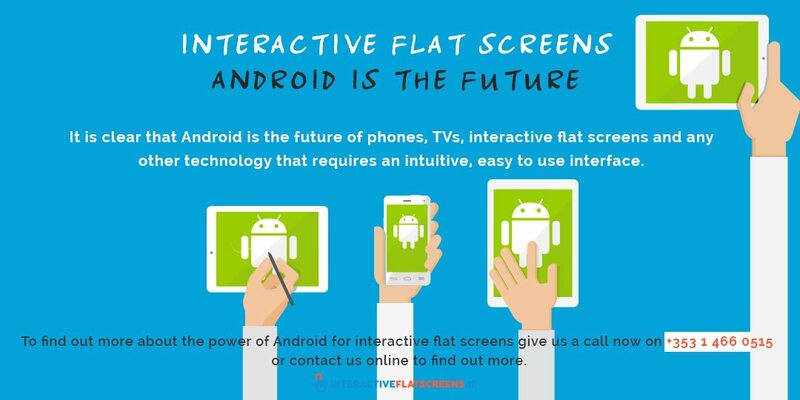 It is clear that Android is the future of phones, TVs, interactive flat screens and any other technology that requires an intuitive, easy to use interface. You are probably familiar with the Android icon – the green robot. How appropriate this is! 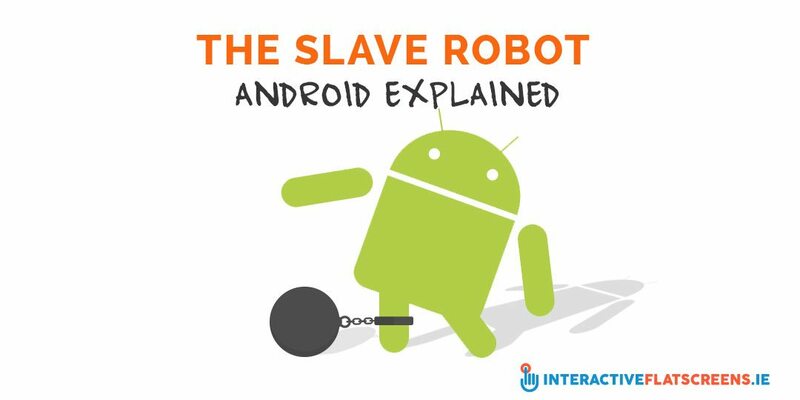 Having Android is like having your own personal slave robot to make life easier for you. Android is ease. Android is choice. Android is power. If you want to harness the power of Android in an interactive flat screen then check out our range of Clevertouch Flat Screens and give us a call now on +353 1 466 0515 or contact us online to find out more! CLEVERTOUCH are Interactive Touchscreen Displays for Education. Clevertouch Interactive Touchscreens are changing the way we educate our pupils a durable alternative to interactive Whiteboards and Projector solutions. CLEVERTOUCH offers innovative features such as (optional) built in PCs and a built in App store that is focused on education. CLEVERTOUCH offers a FIVE YEAR WARRANTY on its screens. CLEVERTOUCH comes with a variety of education Softwares (Cleverlynx, Displaynote, Snowflake, Clevermaths and Clevernote). All Sofwares are easy to use and are child and teacher friendly! CLEVERTOUCH is very competitive in price. Interactive Flatscreens.ie have been supplying Irish schools with audio visual equipment for almost 50 years. In that time, we have built a reputation for quality, service and back-up support which is unparalleled.